More than 1,500 people shouted “Mafia!”, “Resign!”, “Save Pirin” and “We want nature, not concrete” to slam plans for the country’s Pirin national park they say would open to construction almost half of the UNESCO world heritage site. Chanting “Save Pirin”, “Mafia” and “Corruption”, protesters said the cabinet’s decision to expand the ski area breached a number of nature protection laws and would lead to the destruction of centuries-old pine trees endangering wildlife at the UNESCO World Heritage site. “I am here because I am a Bulgarian and a European citizen and the government’s decision is in contradiction with Bulgarian and European legislation,” said journalist Simeon Tabakov, one of the demonstrators. 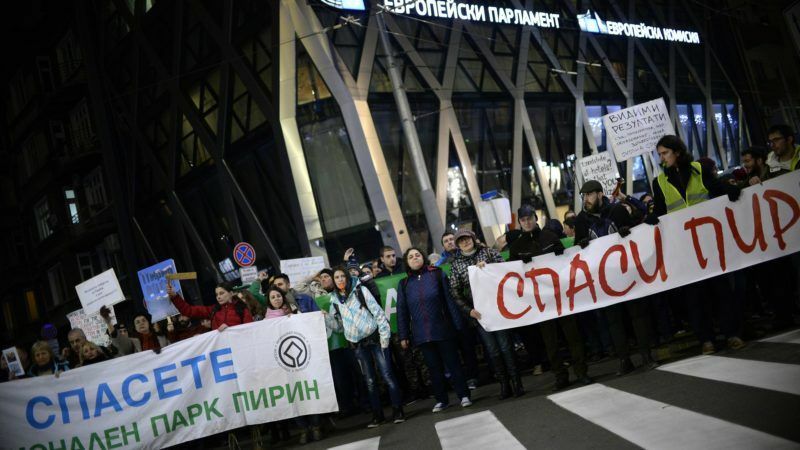 The protesters, who carried banners saying “Bulgaria, wake up and fight” and “Citizens against the mafia”, demanded the resignation of the environment minister who they say is sabotaging the main goal of his ministry. Bulgaria’s environment ministry has argued that the changes will allow construction in only two percent of the territory of the park, with the aim of boosting winter tourism. The government says it has also allowed the building of facilities to collect drinking water in 48% of the park’s territory. Opponents say this could be used as a loophole to allow bigger construction projects. A counter protest in support of the construction of a second ski lift in Pirin to cut long queues of skiers brought hundreds of people to downtown. Many demonstrators carried banners denouncing corruption in the poorest EU member state 10 years after it joined the bloc. “Corrupt we stand strong” one banner read, mocking the “We stand strong” motto of Bulgaria’s EU Presidency which runs to July. Several hundred demonstrators from the southwestern regions of Bansko, Dobrinishte and Blagoevgrad meanwhile staged another rally, backing plans for more extensive winter tourism development in Pirin and the construction of a second chair lift to ease chronic queues of skiers at the popular Bansko resort. Both rallies passed off peacefully but rush hour traffic came to a standstill in Sofia with much of the city centre sealed off ahead of a concert to mark the Presidency opening. A heavy police presence was on hand for the arrival of EU Commission President Jean Claude-Juncker, European Parliament chief Antonio Tajani, EU Council President Donald Tusk and all EU Commissioners. Police also cordoned off the area around Bulgaria’s parliament as several smaller rallies took place. Pensioners demanded a rise in their minimum retirement pay, a small anti-NATO and anti-EU crowd gathered to burn the EU flag and shout “NATO out” and about a hundred people demonstrated against domestic violence. Some police also demonstrated for higher pay, winning a pledge for an additional 50 million euros from Prime Minister Boyko Borisov. Policemen themselves staged several small rallies during the day to demand higher pay and managed to receive a pledge for an additional 50 million euros by Prime Minister Boyko Borisov. Bulgaria’s EU Presidency Minister Lilyana Pavlova slammed the protests, saying they were out to attract attention on the day when Bulgaria’s capital Sofia was a focus of international attention.